Sunrise, FL – All hope is not lost! However, the Florida Panthers no longer hold their future in their hands. Florida heads into today’s matchup against the Boston Bruins, four points out of the final wildcard spot, held by the Philadelphia Flyers. Philly, as a city, has done enough winning as of late (Eagles, Villanova), so they’re due to screw up, right? That’s yet to be seen. The Flyers are facing off against the Carolina Hurricanes, who have already been eliminated from playoff contention. Even if Philly doesn’t cooperate, and help the Cats sneak into the playoffs, a Panther win tonight ties the franchise record for home wins. Another record worth celebrating is Roberto Luongo played in his 1,000th career NHL game tonight. He’s only the 3rd goalie in history to reach a grand behind Martin Brodeur (bruh) and Patrick Roy. Since his Feb. 17th return from injury, Luongo has won nine of eleven starts at home and is ranked 3rd in save percentage. The Panthers have also scored the most goals at home since Feb. 22nd. The problem is that the Cats don’t always play at home, and away on the road they’ve let their playoff opportunity almost completely slip out of their reach, losing five of eight road games in that span. The boys from Sunrise didn’t want the sun to set on their season, and they came out with a sense of urgency, challenging Boston’s defense right off the bat, with a chance on goal within one minute of play. 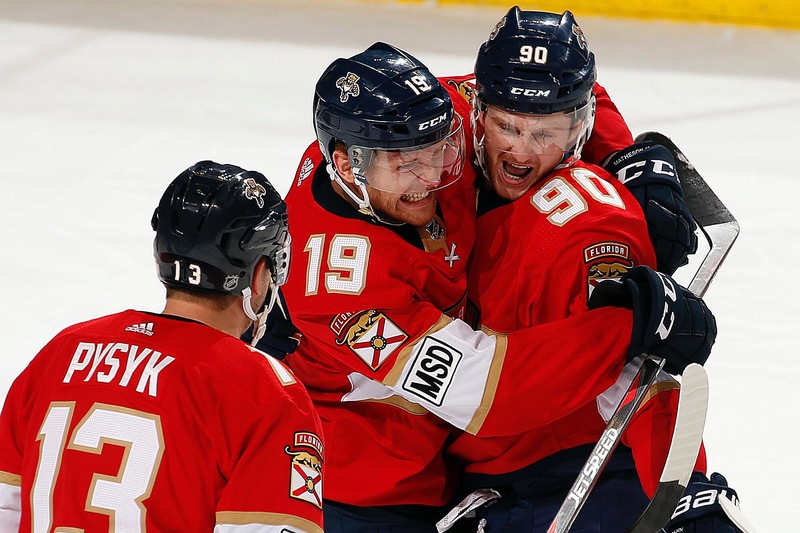 They were aggressive early on, and it would eventually pay off, when Aleksander Barkov, assisted by Aaron Ekblad and Evgenii Dadonov, scored his 100th career goal to put the Panthers up 1-0. Two minutes later, Frank Vatrano would score on his old teammates, assisted by Nick Bjugstad. However, the Bruins would catch the Cats napping to get one back, scored by Ryan Donato. In the 2nd period, Bruins’ Tuukka Rask would keep the Panthers in check, saving 14 shots on goal, while the Bruins only took eight shots themselves, with a Danton Heinen goal to even things up. In the 3rd period, Florida actually took fewer shots than Boston (10-14). However, Jared McCann, who replaced Barkov on the 1st line after Colby Cave hard-checked him against the boards, forcing Barky out of the game, made sure he only needed one of his two shots on goal to give the Panthers a much-needed win. 3-2! The journey continues for the @FlaPanthers. After the game, The Panthers and Bruins players were involved in a scuffle. Nothing happened, but the game was chippy, and it probably had something to do with Barkov getting hit out of the game. Vincent Trocheck was asked, “what’s going through your mind when Barky gets hit and leaves the game?” His response was “I can’t say that on tv.” These guys will meet again in Florida’s final game of the season, in Boston, with possible playoff implications. Next up, the Cats face the last-place Buffalo Sabres in their final home game of the season. They need Philly to lose their finale against the New York Rangers if they want to take that 8th playoff spot. #GoRangers. The Lemon City Live home-ice advantage lives on!